Merges into Battle Action (IPC Magazines Ltd., 1977 series) after 12 November 1977 issue. Action was a controversial weekly British anthology comic that was published by IPC Magazines, starting on 14 February 1976. Concerns over the comic’s violent content saw it withdrawn from sale on 16 October 1976. It reappeared the following month, in toned-down form, and continued publication until 12 November 1977, at which point it was merged with Battle Picture Weekly. Despite its short lifespan, Action was highly influential on the British comics scene, and was a direct forerunner of the long-running 2000 AD. The comic was devised in 1975 by freelance writer/editor Pat Mills, at the request of publishing house IPC. It was intended to reflect the changing social and political times of the late 1970s, and to compete with DC Thomson’s war-themed Warlord title. Warlord was a new type of British boys adventure comic, focusing on military action, with tougher heroes and storylines than had been seen previously. The title was a huge success, and inspired IPC to launch Battle Picture Weekly in direct competition. Battle had been created by Pat Mills and fellow freelancer John Wagner, and was also very popular. Action was intended to be more contemporary and ‘realistic’. IPC’s John Sanders was chosen to edit the title, with Mills, Wagner, and Steve MacManus contributing stories. The team evaluated several names, including Boots and Dr Martens. The comic was briefly to have been called Action 76, with the title incrementing each year, until it was christened simply Action. Many of the stories in Action were what Mills called “dead cribs”, essentially rip-offs of popular films, books, and comic heroes. Rather than being a straight copy, the “cribs” in Action had their own slant on the idea. Hook Jaw, for example, combined environmental issues with the graphic gore and shark anti-hero of Steven Spielberg’s film Jaws (1975), a box-office success, while Hellman of Hammer Force was a Warlord/Battle-style World War II adventure told from the point of view of a German Panzer commander. The first issue was published on 7 February 1976, with a cover date of 14 February 1976. The comic was instantly popular, particularly for its gritty tone and graphic gore. Within weeks the media had picked up on the title’s violent content. The London Evening Standard and The Sun ran major articles on the comic, with the latter echoing the Victorian “penny dreadful” by dubbing Action “the sevenpenny nightmare” (the cover price was 7p). Over the next few months Action was the centre of a campaign led by Mary Whitehouse, of the National Viewers and Listeners Association, to censor or ban the comic. IPC eventually started to moderate strips to forestall possible boycotts by newsagent chains such as W.H. Smith. In September 1976 John Sanders appeared on the television programme Nationwide, where he tried to defend the comic from a vigorous attack by interviewer Frank Bough. Although Action remained popular, its days were numbered. Pressure within IPC’s higher management, and alleged worries that the two major newsagent chains, W.H. Smith and John Menzies, would refuse to stock not just Action, but all of IPC’s line, led to the 23 October issue being pulped. The title returned on 27 November (cover date 4 December), but the violence was toned down, and the previous sense of anarchism was replaced by a safer, blander feel. Stories like Hook Jaw were no longer drenched in blood and gore, but instead were full of safer and more reliable heroes, and traditional villains. Sales dropped drastically, and the last issue before merging with Battle was published on 5 November 1977 – dated 11 November. Battle became Battle Action until 1982, at which point the Action name was dropped entirely. However ‘Action’ annuals continued to be published separately from ‘Battle’ annuals yearly up until 1985. 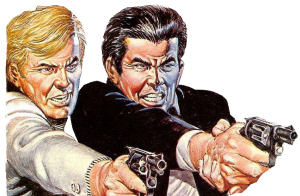 Action was hugely influential in proving to IPC that there was a new market for a different type of boys comic, plus it proved boys adventure comics could have different genres of stories rather than focusing on one genre. Mills learned how to deal with the launch of a varied, edgy comic when planning the launch of 2000 AD the following year. By setting the comic’s stories in a science fiction context, and creating the violent character of Judge Dredd as a law-upholding policeman, Mills hoped to avoid the controversy that had ultimately led to the demise of Action. Some strips with an Action feel were printed in early issues of 2000 AD, including Flesh, which was a violent time-travel story involving dinosaurs, and Shako, which was essentially Hook Jaw but with a polar bear instead of a shark. In 1990 Titan Books released Action – The Story of a Violent Comic written by Martin Barker. This was a history of the comic, as well as a study of the effects of the ban. In this book Barker revealed that 30 copies of the 23 October issue were saved and the book prints many of the strips from that issue, plus following issues thanks to Barker coming into possession of unpublished art. The book reveals just how much Action was being censored at an editorial level, and the route the title was heading in before it was cancelled. Hook Jaw was created by Mills as a Jaws cash-in and the flagship title of the comic. The strip was scripted by Ken Armstrong and drawn by Ramon Sola. Hook Jaw is a Great White Shark and the hero of the series, even though he spends most of his time eating most of the human cast of characters. The name Hook Jaw comes from the gaff hook stuck in the shark’s jaw after some fisherman tried to catch the creature shortly before being eaten by it. Mills gave the strip an environmental edge by having Hook Jaw eat corrupt humans, or criminals, seeking to exploit the seas, as well as anyone else unlucky enough to get near him. Hook Jaw appeared in three stories before the ban. The first was set on an oil rig, the second was set on an island resort in the Caribbean, and the third was set just off the south coast of England. Hook Jaw returned after the ban, but no longer ate as many people and if he did it was off panel. The strip also lost the environmental themes Mills had placed in it. Spitfire Comics in 2007 released a collection of the pre-ban strips in Collected Hook Jaw vol.1. BlackJack was created by John Wagner, with art by Trigo. It told the story of Jack Barron, a boxer who fights to help poor kids knowing that he runs the risk of going blind. The strip was accused of being racist even though it was one of the first times a black character was the hero of a British Comic strip. Death Game 1999 was written by Tom Tully. The series was a cash-in on the success of Rollerball and dealt with a lethal future sport played by condemned prisoners. Art was provided by Costa, Ian Gibson (2 pages) and Massimo Bellardinelli among others (John Stokes). The strip was almost as popular as Hook Jaw. After the relaunch Death Game 1999 became Spinball, and turned into a formulaic adventure strip without the ambiguities which featured in the original. Kids Rule OK was written by Jack Adrian with art by Mike White; this series drew most criticism. London, 1986: A plague has wiped out the adult population, with the result that violent gangs of children run riot. The strip was instantly controversial with its heavy anti-authoritarian tone and extreme violence. The strip never survived the ban; two episodes were destroyed by IPC entirely, whilst those that did survive were heavily edited. A full version of the story, with a text insert to cover the missing episodes, can be found in Action – The Story of a Violent Comic. Hellman of Hammer Force, written by Gerry Finley-Day, was the story of a German Panzer major. It established a pattern followed by 2000 AD for having unconventional or unsympathetic characters as the hero. The strip returned after the ban, but stripped of its politics became a conventional war adventure story. Dredger was a tough Dirty Harry–type agent. The strip was popular due to its increasingly bizarre and violent action scenes. The strip survived the ban, but like the others became a conventional adventure strip. Look Out For Lefty was an unconventional football strip based on the adventures of Kenny Lampton, a working-class teenager whose powerful left foot gave him the nickname of “Lefty”. It was unlike any other football strips in British boys’ comics at the time because the strip would include football hooliganism, as well as Lefty’s not always being a clean-cut hero. The violence on display in the strip mirrored the real-life football violence taking place at the time, most notably during a game between Aston Villa and Rangers. After the ban, the strip became a conventional Roy of the Rovers–type strip and removed any hint of controversy. The strip was written by Tom Tully, with art from Barrie Mitchell and Tony Harding. Action had a total of 9 Annuals from 1977-1985. Action had a total of 5 Specials from 1976-1980. Thanks, very welcome for the next update. You are doing nothing wrong, but Adrive isn’t that good anymore for downloading, you have to react fast to click away the unwanted ads and software. And it changes from day to day, sometimes there are none, or almost none, unwanted ads. I am working on replacing all Adrive links, but that is very timeconsuming because i have to make new packages, upload and replace the old links for new ones. I don’t know when that will be finished because i have more work waiting for me. 1977, 1978 & 1980. To complete the Annuals you only need 1979, 1981-1985. A total of 6 Annuals, I will look out for them for you. Action Comic published by Ipc Magazines Ltd, was the Comic that produced the story Hook Jaws. After a six-week hiatus, Action reappeared at the end of November, but in the meantime IPC Magazines had replaced its editor, John Sanders, and drastically toned down its content to make it as innocuous as every other British comic on the market. I remember buying a few copies of the revamped Action and being dismayed by the fact that (a) Hook Jaw was no longer in colour, (b) the shark now only ate about one person each week, and (c) the eating now mostly occurred ‘off-panel’. Hook Jaw, meanwhile, had an environmental theme. The humans whom the killer shark confronted and, inevitably, ate from week to week were scumbags despoiling his marine habitat – the roughnecks on an oilrig in the original set of Hook Jaw stories, the shysters running a ghastly-looking island holiday resort in the next set of stories. But obviously, what impressed me back in 1976 was the comic’s in-your-face violence. It had panels that, 40 years later, I can recall more vividly than anything else I’ve ever seen in a comic-book. For example, a colour panel in Hook Jaw – much of that strip was depicted in colour, for obvious reasons – where Hook Jaw and his toothy pack of fellow sharks devour the survivors (no longer surviving) of a ditched-in-the-sea airliner. Or a climactic panel in Dredger where the agent, flying a helicopter, takes out a whole rampart of villains by swooping at them, shredding them with the rotors and turning them into a shower of bloody body parts. The Link for Action 1-12 is not working !!! Adrive is a pain i know, sometimes when you try the next day it is working again, but sometimes not. After summerbreak i will replace all Adrivelinks 1 by 1. I tried downloading a few and i had no problem. Sometimes you have to try it again the other day because of temporary problems. Hi! Great job with this archive of Action! Looking through the Action Annual 1980, I noticed there are a few pages missing. The first “Cliff Hanger” story seems to be missing two pages – 30 and 31 (using the actual page numbers, not the file numbers). In the index it says the story goes from page 30 – 32, but there is only the last page of the story (32). “The Silver Colt” story seems to be missing pages 77 and 78. “The Ghost of Jason Rollo” is missing the last page(s). Page 126 has been repeated. Does anyone have copies of those missing pages? So great to read Hellman, Spinball, Dredger, Hook Jaw and Cliff Hanger again after all these years! Thanks! Thanks for letting me know. Perhaps you can make your comment on the homepage, that is were most people read.